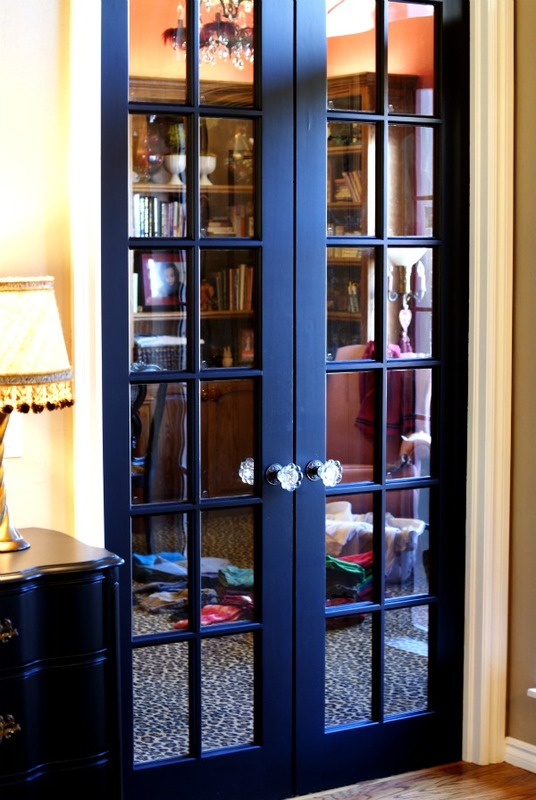 I wanted to share some projects that I've completed around here lately, so I'll just cut to the chase and show the before and after pictures. Those are our favorites anyway, right? Some were quick changes and some a little more time consuming, but with all of them I came away thinking "Why didn't I do that sooner?" 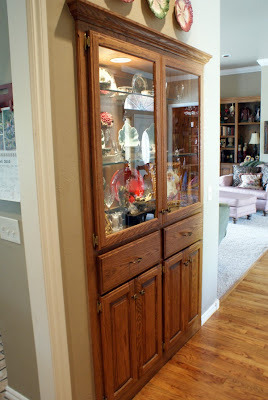 Built in China Cabinet-This was a big experiment! 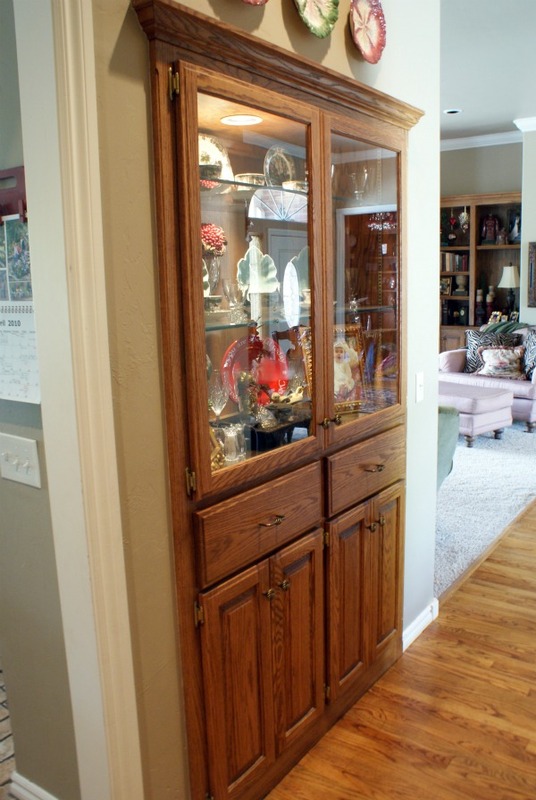 All of our kitchen cabinets and built-ins in the living room and study are stained oak. 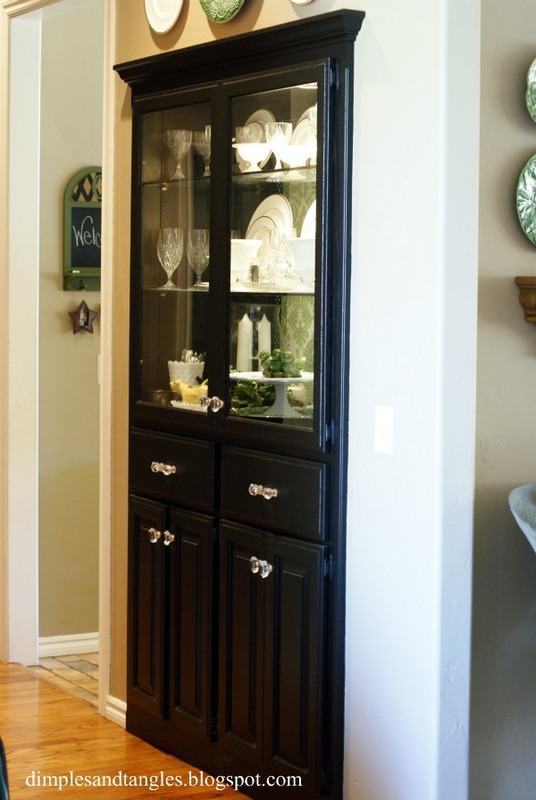 I have always loved stained cabinets, but was ready for something different in this house. 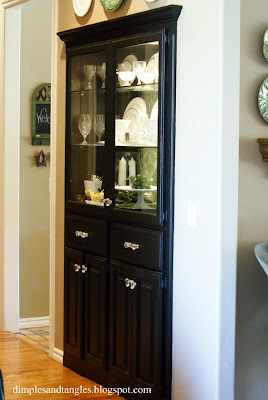 I painted this cabinet first as a test to see how painting the rest of the stained cabinetry might look. I loved it! By the way, I didn't sand, prime, or do anything the way I was probably supposed to. 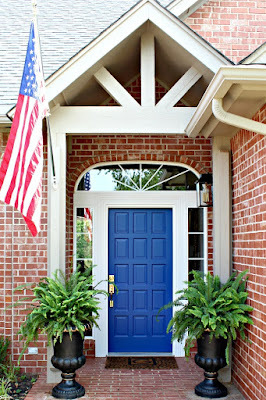 I love Behr's Paint with Primer from Home Depot. A little pricey, by totally worth it. 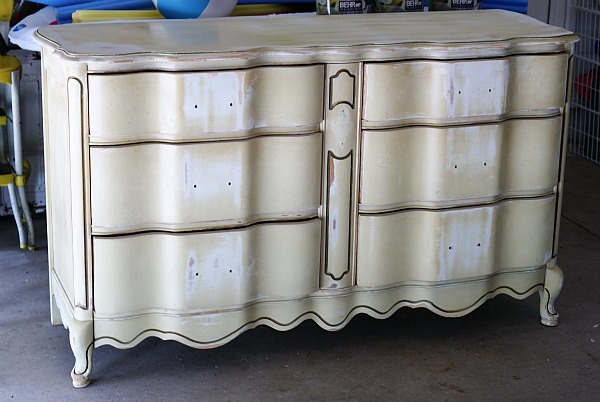 French Dresser-I jumped on the old 70's french provincial craze and found a bedroom set on Craig's List. I had been wanting something more substantial than what was already in my entry, and this dresser fit the bill perfectly. 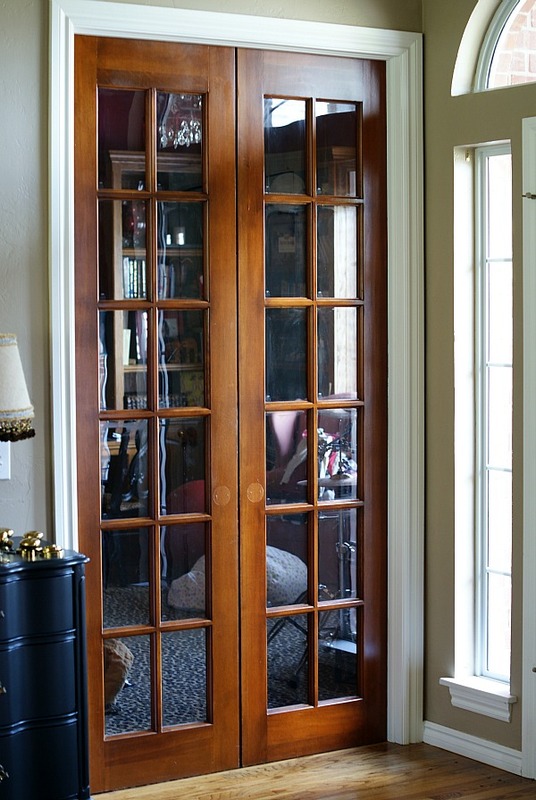 I used the same can of paint from the china cabinet and kept the lovely brass original handles. Love it. Kitchen Table and Chairs-I purchased these at the same house where I bought the french set. 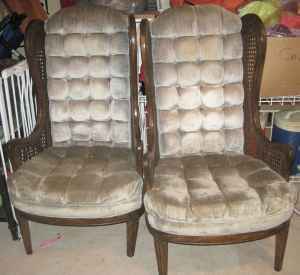 I bought them intending to use only the chairs and the table sat in my garage for months. I finally just decided to see what it would look like and the wood was GORGEOUS under that old plasticy-looking top. 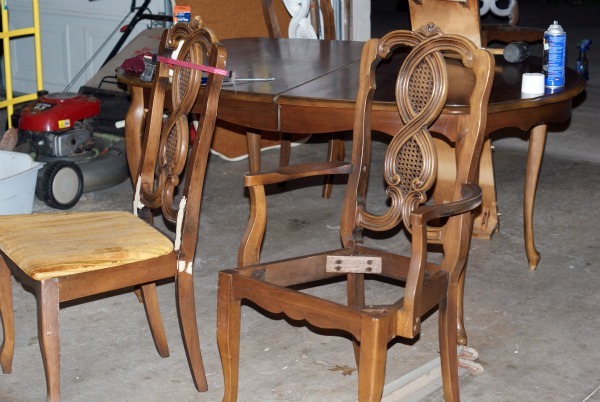 The chairs were pretty bad and definitely needed some gluing and touch-up. The leopard seats will probably be recovered soon, I'm just looking for the right fabric. It's really interesting to me that one of my favorite bloggers, Miss Mustard Seed, lives in Pennsylvania and had this exact set that she also painted. I really like the white, also. 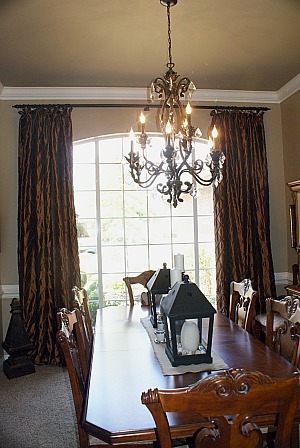 Dining Room Curtains-I made these curtains right after we moved into the house. 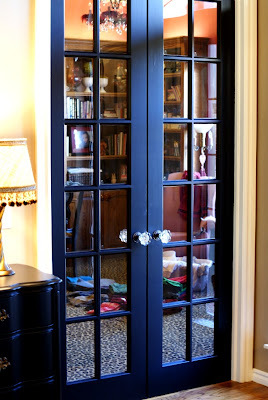 This window is HUGE and I didn't want to spend an arm and a leg for a rod, so I used decorative posts all the way across the top and just tied the curtain with ribbon ties. Recently I thought they were starting to look a little dated hung that way and we really do like to open and close them a lot. I discovered a great curtain rod trick since moving into our house. I buy a long wooden pole from the trim department at home depot for about $2 a foot and have them cut it to the exact size I need, then spray paint it whatever color I want. Then I use my 40% off coupons at Hobby Lobby for the brackets, rings, and clips. Interior Fabrics is also a great place to get ring clips. It ends up being a very economical solution if you need a long custom rod. It still amazes me every day how much of the window was covered up when they were swagged across. I can see the sky now! 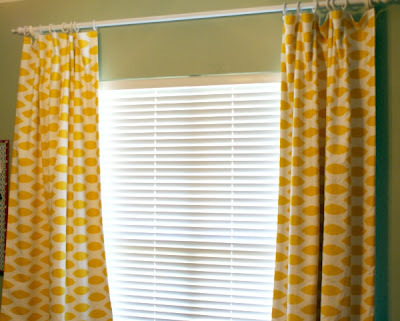 Emily's Curtains-I'm just finishing a total room redo for Emily and want to share it all in a post soon, but here's a little piece. I made the long dotted panels, but they seemed a little plain to me. So, I used Julie's curtains for inspiration and fancied them up a bit. Much better! 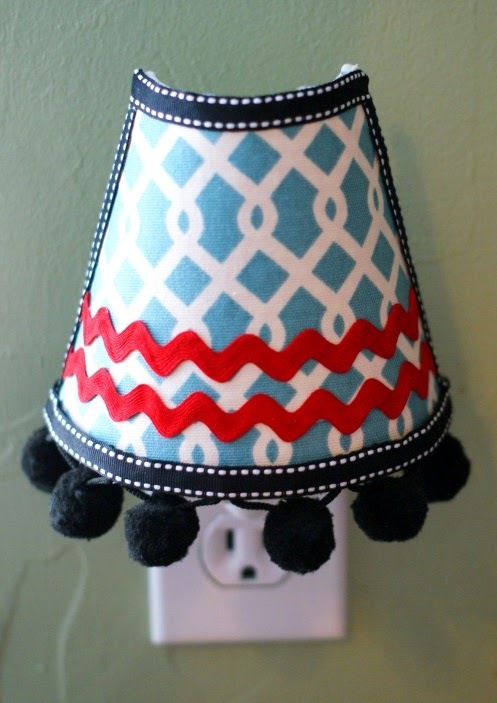 Emily's Night Light-This one was definitely quick and easy. Another snippet of her new room. 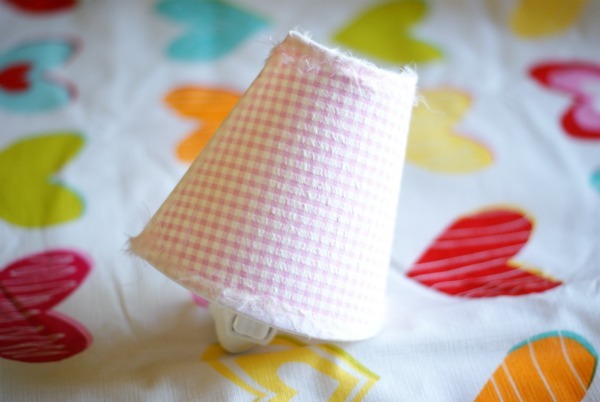 We couldn't have a pink gingham with feather boa trim light with her new colors, so I pulled out a few scraps and re-worked. It's been busy around here! I don't think I'll ever have all of the projects in my head completed. It's so much fun to take trash and turn it to treasures! 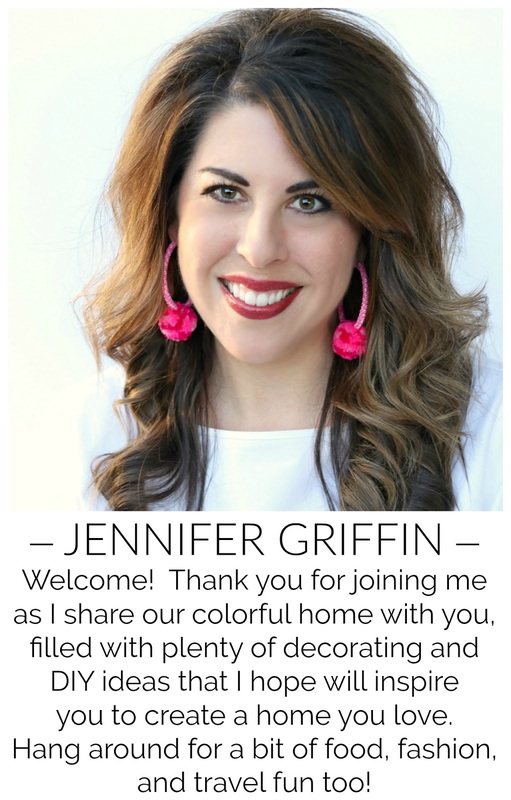 Fabulous projects, Jennifer! Great blog you have here. Nice to "meet" you! 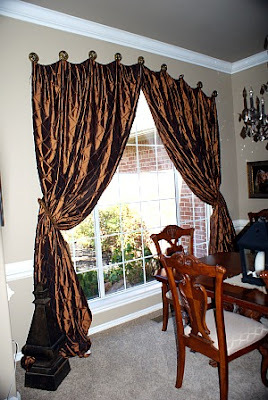 Please provide more information about the "decorative posts" that you used for the first set of dining room curtains. I've been wanting that look forever, but I can't figure out what the knobby things are? Curtain tiebacks? What? 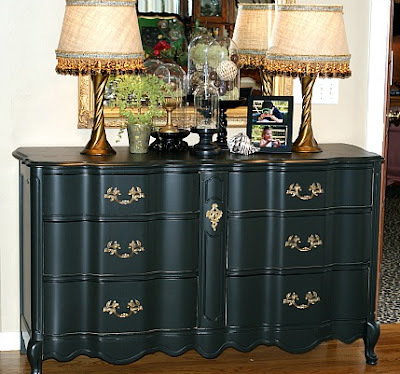 Could you share the paint color for the dresser? Thanks!